[Z06] ZR1 x-pipe adds torque to bone stock '11 Z06 - Dyno'd 451 RWTQ! ZR1 x-pipe adds torque to bone stock '11 Z06 - Dyno'd 451 RWTQ! With less than 550 miles on the car I ran my new 2011 Z06 on a local Dynojet 224 and was pleasantly surprised at the dyno numbers, not so much by the 472 RWHP (since this seems to be pretty well on par with expectations) but at the RWTQ....an amazing 451 ft/lbs! I can only attribute this to the revised exhaust system for the 2011 Z06 where the ZR1 x-pipe is used and the new ZR1 style mufflers......you can see on the on the dyno graph where the exhaust valve opens at 3K RPM and the affect that it has on the very nice smooth torque curve. Dyno conditions were 58°F, Barometer 29.64", 24% humidity and the SAE correction factor was 0.97. The uncorrected numbers were an astounding 488RWHP/466RWTQ! And before you call out "freak or bogus dyno", it is not! I have had one of my other vehicles dynoed locally and on this dyno and the numbers were within 1.2% of each other (well within acceptable standard error limits) and the truth be told, the dyno that I ran the Z06 on was actually the one that registered 1.2% lower! interesting. i've been running this combo on my 07Z for some time now. Now i just need to dyno it. I'm sure there's more fine tuning in the ECU on the newer cars to help with more hp. maybe a data logger guru will chime in. You would think the changes made a difference. If thats the case, Chevy should have upped the specs on the engine as a selling point. Good point! The LS7 505HP SAE rating is through the H-pipe and non-ZR1 mufflers! What a shame....false advertising! I lived in Tacoma for a while. Hard to believe that relative humidity was ONLY 24%. Dyno's are all different from what I've always read. What type of fuel was this on, and what is the octane ? My car also recorded some big torque numbers on a Dynojet 224 with the ZR1 exhaust, but I also have a MF103 on my car. I was able to boost the torque numbers a bit by running a 50/50 mix of pump/109 fuel, where I recorded a max of 484/457. My fuel mix, in conjunction with the MF103, helped lean the WOT AFR in the lower RPM's...bumping both my low RPM torque numbers , which also resulted in higher RPM HP numbers. holy old post batman. i want to see a stock z06 dyno with the different exhaust system. You guys make me laugh.Is that why the 2011 and 2012 are rated at 11.9 seconds in the quarter mile at 123mph and the pre 2011 z06 was rated at 11.7 at 125 mph? 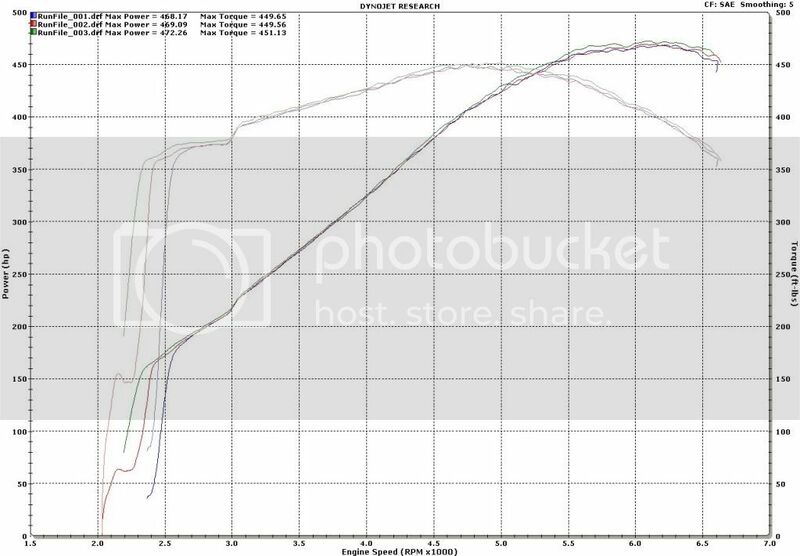 Adding headers only nets a 7 h.p increase on a stock ls7 so your so called mind blowing torque increase is B.S to me.My car recorded 496 h.p all stock on a dynapac dyno but i obviously know thats impossible. 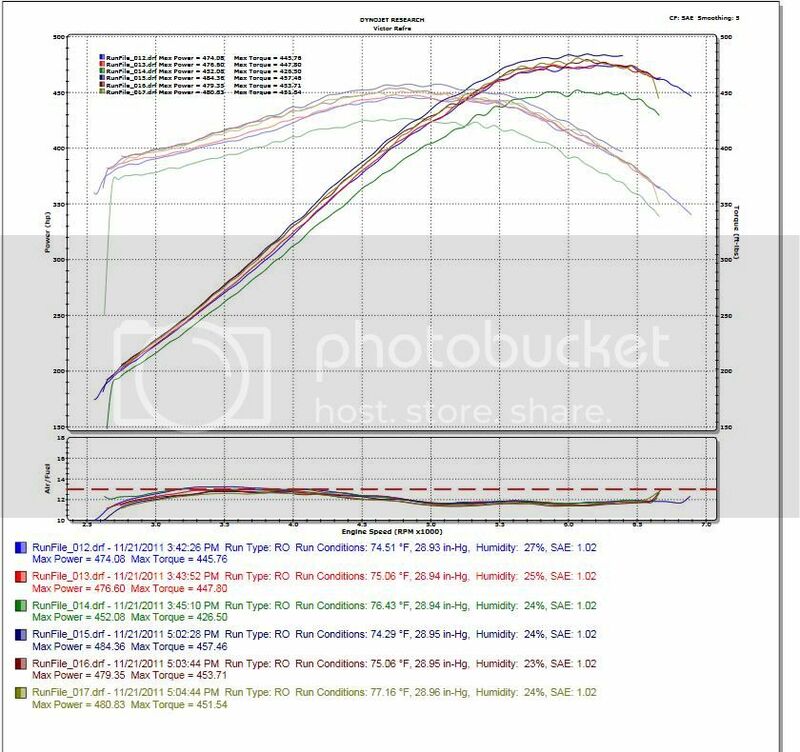 So, instead i look at the gains before and after a cai and a tune.Those gains are whats important not the baseline dyno figures which seem to vary quite a bit depending which dyno the tuner uses. Last edited by camirocz; 05-10-2012 at 11:12 PM. 7hp at peak from long tubes is fine but most of the gains are in the midrange where it counts. Local Union 76 Premium 92 Octane, nothing special! B.S. to you because you don't understand facts and data....show me a pre-2011 non-x pipe ZO6 with this torque value......I can wait while you try to prove you point with data rather than opinions and please don't tell me that a factory E.T. estimate is your data point because if it is...just look at what the cars run here on this forum......far from 11.7 or 11.9 stock! People on this forum don't understand that lol, this section is a joke most the time LOL. I believe those times were attained on a car with the Z07 package which has the larger diameter 20" wheels, which I believe are responsible for the time difference in the quarter mile. I have owned and 06 and 11 Z06, and the 11 def has something extra. I also opted to stay away from the 20" wheels to preserve acceleration. Need to dyno this car soon. Some people get hung up on dyno numbers which really aren't that important. To me, a dyno is a tuning tool. The real power numbers shown by trap mph, and even those will differ by track and weather conditions. So mr.JMB what do the cars run here on this forum?You say far from 11.7 to 11.9 stock so again i say to you what do they run?I ran mine so i know! Looks to me like 11.000 is not out of the question and look how many people in just the top 10 are faster than 11.50 bone stock! maybe the x pipe flows a little better but you need to dyno both h and x on the same day , same dyno to really know the difference. Yes, and all the fastest cars are the older cars as well (pre x-pipe). The dyno numbers posted here are interesting but without back to back run both with and without the x-pipe, it doesn't really prove a whole lot. I have to agree, however, it seems that if the cars ('06 & '07's) dyno the same as newer ones and the relative weight of the cars are the same then you would expect 1/4 mile times to be similar, that's all I am trying to point out....as to why there are no newer cars running as fast as these times all I can speculate is that people are either not running them at the track as often because they already know what it "should run" based on people who have already raced theirs or....??? Quick Reply: [Z06] ZR1 x-pipe adds torque to bone stock '11 Z06 - Dyno'd 451 RWTQ!